As the feature size of disk surfaces in magnetic recording continues to decrease and the head hovers just 50 nm above the disk surface, there is an increasing need to ensure planar and contaminant-free surfaces. AFM can be employed to check the surface for defects as well as contamination. The mapping of magnetic forces to topography AFM scans can be used to characterize the domain structure of magnetic materials, as well as to visualize information bits recorded to magnetic media. Fig. 1. 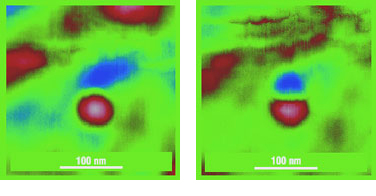 Topography (left) and magnetic (right) images of a Co mono domain particle obtained in lift mode using cantilever from the NSC36 series with Co-Cr coating. Scan size 300 x 300 nm. Image courtesy of Prof. V. Shevyakov, MIET. The AFM technique used for the characterization of the magnetic field distribution over a sample surface is known as magnetic force microscopy (MFM). This is a two-pass mode technique in which the surface topography is measured in tapping mode during the first pass and magnetic forces are mapped on the second pass with respect to the topography data. Cantilevers with a magnetic Co-Cr coating should be used for MFM research. The coating is formed on the tipside of the cantilever. The spring constant and resonance frequency of the cantilever should be chosen to provide stability in tapping mode, as well as high sensitivity to weak magnetic forces during the second pass. Though the cantilevers are magnetized at the facility, a magnetizer may be needed to magnetize them before use in the AFM. It is recommended to keep the probes in a dessicator to prolong their shelf life, which is limited to approximately 6 months due to oxidation. Low or absent magnetic signal implies that the coating has been oxidized by ambient humidity. Note that the structure of "soft" magnetic samples like Permalloy or garnet films can be significantly changed by the field of the Co-Cr coated probe, which has a relatively high coercitivity of 300-400 Oe.